The Charleston Riot by Rebecca Sawyer Spoon. On March 28, 1864, fighting broke out between Union soldiers and local copperheads. The brief battle, which took place on and around Charleston’s courthouse square, left nine dead and twelve wounded. Host Clint Cargile examines the original marble marker for Thomas Lincoln's grave. It was replaced in 1924 and moved to another part of the cemetery. For our third episode, we head down to Charleston, Illinois, a city bursting with Lincoln history, where we meet up with Joe Woodard, a veteran Lincoln presenter who also happens to be beardless. A beardless Lincoln? How is that possible? But Lincoln didn't grow his beard until the 1860 election, so anyone portraying Lincoln's career as a prairie lawyer in Illinois should, for authenticity's sake, be clean shaven. Woodard's tonsured chops have defined his Lincoln career, giving him opportunities not available to his bewhiskered colleagues. In the first half of this episode, Joe takes us on a tour of the Lincoln Log Cabin State Historic Site, which recreates and preserves the farm of Thomas and Sarah Lincoln, Abraham Lincoln's father and step-mother. We also visit Thomas Lincoln's grave, the site of a Lincoln-Douglas debate that took place in Charleston, and the world's tallest Abraham Lincoln statue. There's a lot of Lincoln to cover in Charleston, and it's a complicated side of Lincoln we don't often see in the history books: his strained relationship with his father, his defense of a slaveowner in a Charleston trial, and his controversial views on racial equality. Then Joe and I visit Jackson Avenue Coffee in downtown Charleston, where Joe tells us how he got started as Lincoln, how being beardless affected his career, and how he prepares for the role. We also learn that Joe is not afraid to be critical of Lincoln. You'll find all of that and more in this episode of Drinkin’ with Lincoln. 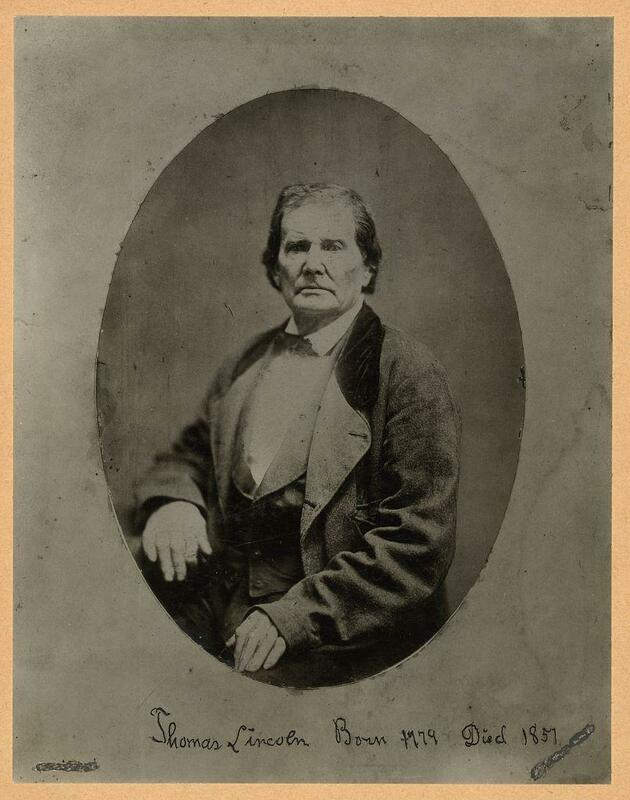 The only known image of Abraham Lincoln's father, Thomas Lincoln. 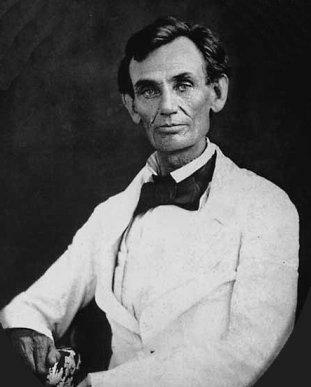 Only known image of Abraham Lincoln wearing a white suit. 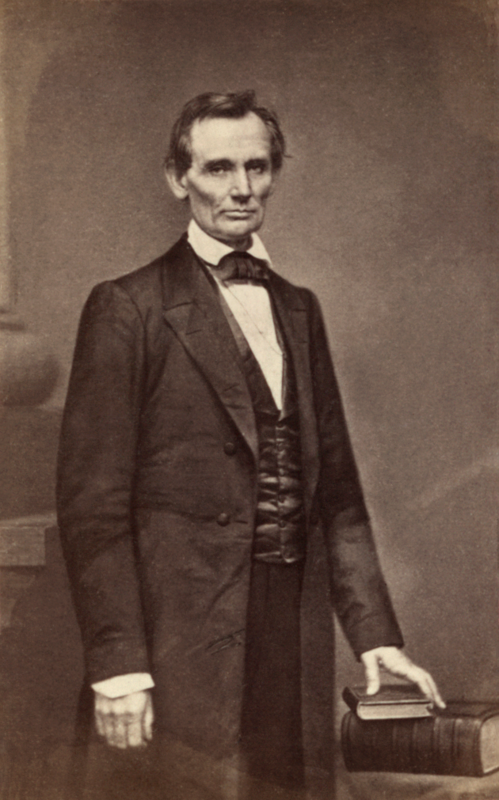 Abraham Lincoln on the day of his famous Cooper Union speech, February 27, 1860. Taken by Mathew Brady. Jackson Avenue Coffee, Charleston, Ill.
In-production Lincoln documentary from Witnessing History Education Foundation, Inc.